The conference will be held in the Dorint Hotel Hamburg Eppendorf, right north of the heart of Hamburg, neighbouring the University Medical Center. Hamburg is the second largest city of Germany and the eighth largest city in the European Union with a population of over 1.7 million people. It is one of the greenest cities of Europe and has many canals – and even more bridges than Venice. The venue is situated in Hamburg Eppendorf, one of the vibrant parts of Hamburg. The hotel is well connected to downtown by public transport (Buses going every 5 to 7 minutes, Bus stop 400m from hotel), therefore we can recommend not to travel by car. There is a good connection to the Hamburg airport, which is 6km away or 40 minutes by public transport, and which can be easily reached from U.S. and Europe. The railway Main Station is 5km away or 30 minutes by public transport, served by local as well as long-distance trains. Transportation to the events is partly provided by the organizers or can easily be done by public transportation. We will give directions for that. If you are a group of at least two people that drive together the whole day and after 9 a.m., you can share a 9am Group Ticket for 12.20 EUR. If you are here for a several days, you should consider buying a 24/7 season tickets for 28.70 EUR for the Hamburg area AB. You can Buy this ticket only online or over the HVV-App. These overview maps show the S-Bahn and U-Bahn lines and the major bus lines, and this trip planner provides directions. Starting at Hamburg Fuhlsbuettel Airport (HAM): Follow directions to S-Bahn (green S). Use any train of S1 to the next stop Ohlsdorf, change to U1 (destination: Ohlstedt or Grosshansdorf) - five stops, exit the train at Kellinghusenstrasse, take a bus 25 (right exit of the station) with any destination, exit the bus at the 5th stop Loewenstrasse (Facharztklinik); the hotel is located 80 m behind on the same side of the road. If you arrive by train, it would be good to check on the Deutsche Bahn website the way to your hotel because there could be three possible arriving stations: Central station, Bf Dammtor and Bf Altona. The website of the Deutsche Bahn will tell you which will be the most efficient one. Be aware that your ticket my include the City option (showing Hamburg+City), which means the public transport is included. 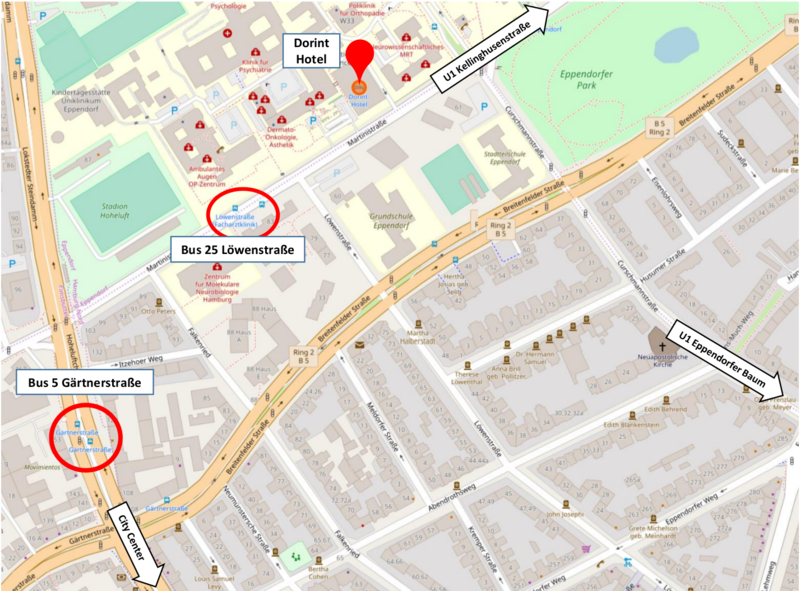 Starting at Hamburg Central station (Hauptbahnhof): Use the U1 (destination Ochsenzoll, Norderstedt Mitte or Garstedt) – exit at 7th stop Kellinghusenstrasse, take a bus 25 (right exit of the station) with any destination, exit the bus at the 5th stop Loewenstrasse (Facharztklinik); the hotel is located 80 m behind on the same side of the road. From the hotel, turn right and follow Martinistrasse 200m to Hoheluftchaussee, turn left; the bus stop is located after 150m on an isle between the lanes. Use bus 5, going down, with any destination. Buses go every 5 or 7 Minutes. Recommended bus stops in the city center are Jungfernstieg, Rathausplatz (City Hall, there is ICSA‘s Welcome Reception), or HBF/Mönckebergstrasse (close to Hamburg Central station). There is an official tariff for all Hamburg taxis (yellow taxi sign on the roof), that is applied as soon as the taximeter in the car is started: except rush hour 3.50 EUR + 2.45 EUR per km, during rush hour (7-10 a.m., 4-7 p.m.) 4.20 EUR + 2.50 EUR per km (lower price per km for longer trips). There are several companies, including Hansa Taxi +49-40-211211 and Taxi Hamburg +49-40-666666.